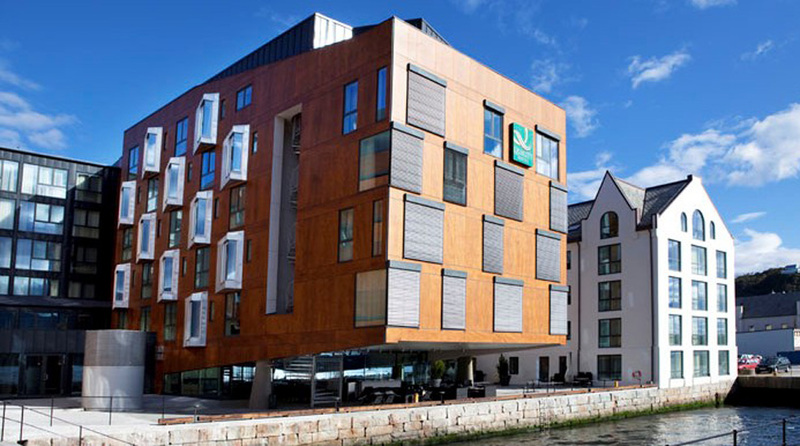 The Quality Hotel Waterfront is a modern conference hotel right in the heart of Ålesund. This is a popular venue for business events for up to 450 people. Guests can look forward to the Aqua restaurant and stunning views of the fjord and the mountains! Our moderate double rooms are furnished with a double bed (160 cm wide), modern designer furniture and a flat screen TV. This room type is smaller than our standard double rooms and has a limited view. The rooms are located in three buildings, each with their own architecture. All our standard double rooms are decorated with modern furniture, comfortable beds, desk and flat screen TV. The rooms are located in three different buildings, each with their own specific architecture and design. Many of the rooms have beautiful views and most have parquet flooring. All our standard rooms are decorated with modern furniture, two comfortable twin beds (90cm), a desk and flatscreen TV. The rooms are located in three buildings, each with their own architecture and design. Many of the rooms offer lovely views of the surrouding area. Our superior double rooms are larger and have better views than our standard double rooms. Our superior rooms are located in three buildings, each with their own architecture and style. All the rooms are decorated with modern furniture, comfortable beds, desk, flat screen TV and minibar. Our deluxe double rooms are nice and spacious. Many of the rooms are situated at the front of the hotel offering fantastic views of the fjord and mountain landscape. Guests will stay in one of three buildings, each with its own architectural style and unique décor. The deluxe doubles feature a kettle and coffee machine, lounge area and flatscreen TV, and the beds have huge pillows for added comfort. These rooms are ideal for those of you who would like plenty of space or an extra luxurious hotel stay! Our deluxe twin rooms are nice and spacious, with two single beds (90cm) and they are ideal for families (4-5 people) wishing a little more comfort. Many of the rooms are situated at the front of the hotel offering fantastic views of the fjord and mountain landscape. The deluxe twin rooms feature a kettle and coffee machine, lounge area, flatscreen TV and sofa bed, and the beds have huge pillows for added comfort. We have two different types of family rooms. Standard family rooms and upgrade family rooms. The standard rooms (22–24 m2) are equipped with twin beds (2 x 90 cm), as well as two drop-down wall-hung beds. The upgrade rooms (35–38 m2) have a double bed (160 cm) and sofa bed for two people, seating area and tea & coffee making facilities or coffee machine.